Early that morning, I got the word to go home. Staff Sergeant A stomped down the trench and told me as I sat with Marines of 3rd Squad sharing C-ration coffee and unfiltered Camels and palavering about women and GTOs. He’d told me twice before that I was going home: once, the day after the Payback Patrol, and then two days later, only to find out he was joking, as he liked to call it. When he said that, “I’m just joking,” he laughed and leaned over and slapped his quadriceps. I didn’t think it was funny. And on this particular morning, as I looked at him like he was full of crap, he glared at me like all staff non-commissioned officers in the Marine Corps were wont to do. I still didn’t believe him, and I sat there looking into his eyes and I’m sure my feelings swarmed across my face. 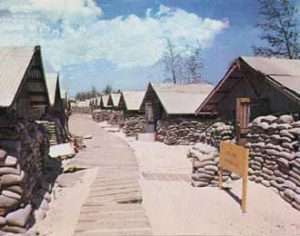 Photo of Dong Ha, 1968. Reminiscent of the transient barracks where the blogger spent the night of 4-4-68. Photo from Pinterest. He said, “Get up and go home, Rodgers. That’s an order.” And he clomped off. I followed him down to the platoon command post and stuck my head in and Lieutenant D said, “Good luck, Rodgers, you’ve been a pretty good Marine. Occasionally damned good. Sometimes not so good. Gather your gear and get down to the company CP and report to Captain Pipes.” He got off his cot and stuck out his hand. His big mitt enveloped mine as we shook. I divvied up my M-16 magazines and poncho liners and other gear among any of the men who needed them and figured I’d fight it out later with the supply personnel when I showed up short of gear in Phu Bai. I walked up and down the trench slapping hands and jive-assing with everybody in 2nd Platoon that I knew, and then marched for the company CP. When I stuck my face into the bunker men crammed the innards: radio operators, the company gunny, the executive officer and Captain Pipes who sat against the sandbagged walls with his arm in a sling and other parts of his head and torso bandaged due to the wounds he received on the Payback Patrol. The executive officer sent me down to Battalion where I explained my situation to a bunch of corporals who sent me to see sergeants who referred me to staff NCOs who sent me on to see a major who sat alone in a big room in a deep bunker. This is one of the damndest memories I have of this experience. When he asked me if I’d been on the Payback Patrol and I said, “Yes, Sir,” he took my orders and signed them and then he stood, snapped to attention and saluted me. For a moment I felt flummoxed, and then I saluted him back. Then he shook my hand. That was pretty amazing, a major saluting me in reverse order of how it should be. I headed for the LZ where the helicopters came in to deliver men and gear and pick up men and body bags filled with people killed in action. Sometime during my wait, another Marine showed up who’d been through training with me back in The World. He was also going home. He was a lance corporal whose last name was R. He looked battered, skinny, his face gaunt after seventy-some-odd-days of incoming and pitched battles. He needed a new set of dungarees. We chatted, but not much, mostly just sat there as I pondered all I’d seen. The horrors and the blood and the flesh separated from the tendons and bones of men I’d come to revere. Every time a loud noise sounded, R would flinch and so would I, and I wondered if I looked as bad as he did, and then I understood that I did. A pile of filled body bags were stacked against a sandbagged revetment. I kept looking at them and wondering if I knew any of the intelligences that had once inhabited the remains. Late in the day, a CH-46 came in and R and I got on along with those body bags. On the flight to Dong Ha, even though I was ordered to do so, I refused to sit down in case we took anti-aircraft fire through the bottom of the bird. I wanted to make the smallest target possible. At Dong Ha I checked into the transient barracks and spent over an hour in the hot shower trying to get the red mud of Khe Sanh out of the pores of my skin, as if cleansing myself of the dirt of that place would purge me of all that I had seen. Later, after chow—real chow, hot chow—I stood outside the mess tent with a group of Marines, one of whom I’d known well in boot camp and ITR. For several hours I listened to men talk about Tet and Hue and Con Thien, including that Marine. I could tell by the way he kept staring at me that he wanted to hear my tale. But I didn’t say anything about anything. No words could dig their way from my thoughts to my mouth. On the screening front: On April 7, at 1:00 PM Bravo will be screened at the Warhawk Air Museum in Nampa, Idaho. following the screening, there will be a panel of Khe Sanh survivors who will talk about the experience. You can find out more about the event and the Warhawk Air Museum here.